IMPORTANCE OF PLACE: Convenience: For Autos or People? Convenience: For Autos or People? 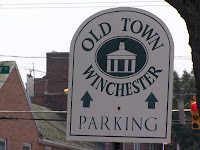 Like many downtown areas, Old Town Winchester (a remarkable place) battles the perception that it is "inconvenient" because it is a "difficult place to park", despite the fact that there are thousands of spaces and numerous lots sprinkled throughout town. Many mall shoppers have gotten used to driving into vast "lagoon like" half-empty parking lots or driving right up to the front of a mini-mall store and turning off the engine. If they have to walk a block, they deem it inconvenient (though often they have to walk far greater distances from a big box lot). Developers have done a brilliant job of selling the convenience of No Place, which is ironic since I've seen people in our area sit for 20 minutes at a light just to get out of their suburban community. And I've seen people get stuck for hours in traffic snarl when attempting to shop at a grand mall like Tyson's Corner. Logically, has it ever made any sense that a business needed four to ten times their business space just to accommodate their patrons or workers transportation. Further, have you noticed that in the rare cases where trees exist in or near these "heat islands"; these great asphalt deserts, people flock to them first as their only refuge for auto or human. Did you ever wonder why, until we create a better alternative, these spaces would not serve everyone better if solar arrays were erected to produce considerable energy plus welcome shade for the people using them. It wouldn't do much esthetically, but it would doubtless produce far more power than any mall would require for it's own consumption; plus generate a surplus to sell on the open market. Interesting idea. Would these "solar arrays" prevent parking or be in addition to current parking? So what you're saying is that as long as we've built these vast parking lots for the automobile, we still have the opportunity to turn them into gathering places (on hot days for instance) while simultaneously taking advantage of their heat-drawing capacity to produce power. I wonder if we could build solar arrays in a way that would create "place"? Not just a utilitarian space but a real place where people would want to linger . . .
One nice thing about solar panels is that they are relatively light weight. What they require is space. It would seem a simple support arrangement could be engineered to elevate the panels without infringing on parking space to any significant degree. Islands and curbing is often part of parking lot design in any event and these areas could be used for support structure. Of course, some minor infringement would be required for transmission equipment. Is there a down side? How about bird poop on your car? These structures are inviting places for building bird nests. As to making the parking lots esthetically appealing?? 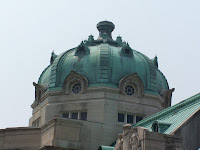 Some shelter would be provided from wind sun and weather, but making such a place inviting would tax our imaginations a bit. It would be well worth the attempt, as from an economic standpoint, what would make more sense than providing a place which would attract potential customers?